Day 6: I woke feeling much the same as every day – ugh, I want more sleep. I didn’t have time to make myself food to take to work due to a busy morning with the children. Do any single parents trying to get 2 children out the door find it harder than you would think?! Morning food: Ginger & pear Kombucha, Fine Fettle “flats” – apple & Berry (ingredients: Apple, berries, almonds, buckwheat, linseed, maple syrup). Lunch: whole pack of beetroot & hazelnut flats (beetroot, apple, hazelnuts, linseed, lemon juce, salt). 2 cups genmai Cha organic tea. 2 x Kuranda fig & walnut bars. Afternoon: salted cashews & hazelnuts, tamari almonds. Soy latte & a short black. Dinner: yummmmmy tuna, organic pasta sauce, organic broccoli, organic parsley, lemon zest & freshly squeezed lemon. Very satisfying! After dinner: 2 cups Madame Flavour mint & lavender tea (current obsessions!) 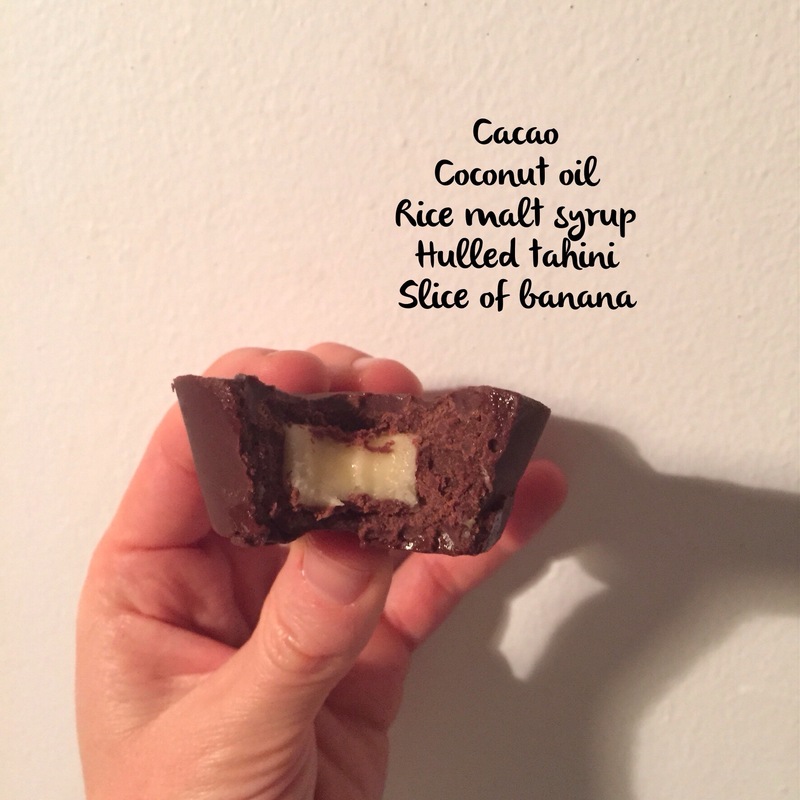 Dessert: you guessed it – home made chocolate – this one was pretty good – cacao, coconut oil, rice malt syrup, hulled tahini & in the middle, one slice of banana. What I did well today: same as every day in that I had none of the “banned” foods. Dry brushed, then moisturizer with almond oil after the shower. Vitamin E on worst part of the rash on my face. I was calm all evening after getting home from work until the boys went to sleep. I admit sometimes after 3 days at work, my little one at daycare & my older son currently on holidays (so being juggled between family & vacation care), I am tired. What I did badly: poor intake of fruit & veg, no proper breakfast or lunch. As per many days, did not leave the office from 9am-5pm so sat under fluoro lights with no natural light for 8 hours straight. Have not had any eggs in 3 days (sorry Anthia!). Forgot the tonic this morning so had to have the whole days quantity in one revolting shot – which, on the plus side, should be enough to prevent me doing it again! This entry was posted in Nutrition and tagged dairyfree, foodrestriction, glutenfree, naturopath by 6 Clean Ingredients. Bookmark the permalink.